A lick of new paint added to a building built between 1406AD and 1420AD, I’m personally not sure if this should be done or if we should just leave the buildings to show their natural beauty and time travelled faded colours!…I guess the custodians think they will look better for tourist visitors to see and to photograph or maybe they beleive the added colours will protect for generations to come!…What do you think?..Should we renovate and re-colour ancient buildings or try to protect them as they are? That’s a tough question. If these buildings are exposed to the elements they need to be protected. Properly done, this can not only protect but enhance. It’s interesting, isn’t it? Can you imagine the Parthenon back to its multi-coloured glory? I like the aged look myself, but … Wood is such a fragile medium, it does need protection. Also, I suspect the paint in the Forbidden City was constantly being freshened over the centuries – just suffering neglect after the ouster of its inhabitants – so it maybe looked a bit like Aunt Myrtle’s faded kitchen cupboards rather than a highly weathered and intriguing patina before it’s bright new coat? 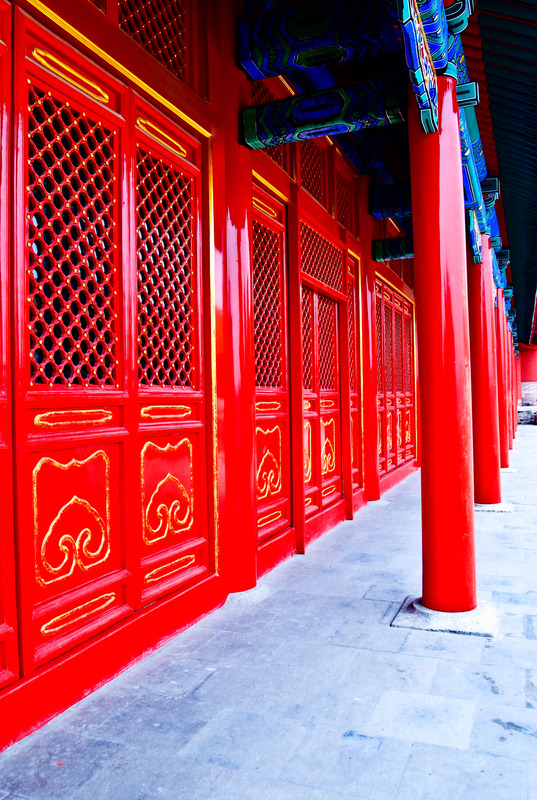 The high gloss and brilliant colours suit Chinese buildings and the standard of the restoration looks to be excellent. Thinking photographically, I think that my approach to ‘old looking’ and ‘freshly painted’ would be quite different, rather like a line of soldiers in best uniform and a group of civvies waiting in a line…. perhaps formal and informal……. an approach that best brings out the character or the impact of colour. Its funny, an unrestored vintage car in original condition is worth more than one that been repainted and I prefer taking photos of tumble down barns than barns that have been converted. Character and patina are treasured, yet I couldn’t sell my house if it had too much of the latter. Whatever is done it won’t be right in someones eyes. At least these buildings have survived and they are clearly highly regarded. I couldn’t agree with you more John…Thanks so much for your take on the question.